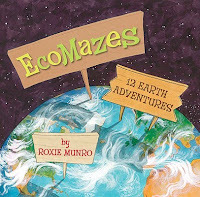 EcoMazes: 12 Earth Adventures by Roxie Munro. (Grades 1-5.) Sterling Press, April 2010. Review copy provided by publisher. One thing you learn quickly when you're a children's librarian: kids love to search for things. I defy you to keep I Spy books on the shelves (actually, I will tell you how to do that: hide them in the 700s). So EcoMazes, with a maze for each biome and the challenge to find animals of that habitat hidden in each spread, has built-in kid appeal. While it doesn't include a TON of information on these biomes, it will spice up the topic. EcoMazes: 12 Earth Adventures is a great book to have in classroom libraries if you do a unit on biomes. The following biomes are covered: tropical rainforest, desert, coral reef, alpine high mountain, arctic polar, wetlands, tundra, grasslands, antarctic polar, savanna, conifer forest, and temperate forest. Each biome gets a spread with a maze and several animals to seek and find. The second half of the book revisits each spread with the answers to the maze and search and a couple of paragraphs of information about the habitat. The book gets points for kid-appeal and for the variety of biomes included, but I am not a huge fan of the layout. For one thing, on the spreads where you're searching for animals, there are no identifying pictures included in the list of what you're looking for. You can tell me to look for a caiman, but if I have no idea what a caiman is, how can I find it? Another problem is that the bulk of the actual information is included in the second half of the book with the answer keys. I don't see many kids pausing to read through those hidden paragraphs. I wish the information had been integrated with the mazes in some way. I also wish that maps had been included showing me where in the world these biomes can be found. When combined with other books in a unit on biomes, these flaws may be less of an issue. Read more reviews at Sage and Savvy and Booking Mama. EcoMazes is on shelves now! And today's Nonfiction Monday! Bookends has the round-up. Make sure you check it out. My kids love looking at all the mazes and the book inspired us to learn more about the ecosystem where we live (we even made our own large scale maze). We just referred to the answer key when we came across unfamiliar animal names.